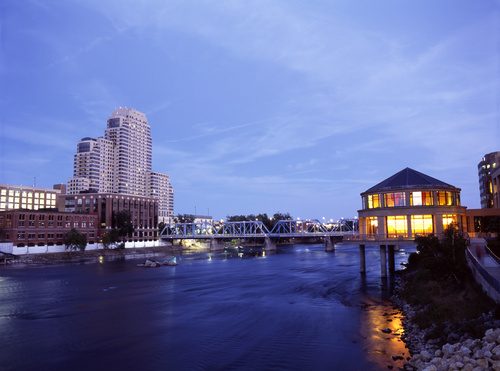 The Grand River is a unique venue involving multiple factions from the City of Grand Rapids. Artists wishing to place art INTO THE RIVER (parks and bridges do not apply) must follow a unique process with unique deadlines, detailed below. The City will convene two panels to review the proposals. The first panel will review the aesthetic merits of the work, and the second will review the engineering and technical merits. The artists that are chosen will be instructed by the City to develop and pay for a permit application to be filed with the Department of Natural Resources and Environment (DNRE). Is the City breaking the rules by setting its own deadlines? ArtPrize is designed as an open framework. We have only a few simple rules, and we depend on artists, venues, and the public to find creative ways to operate within a simple structure. As long as the City registers the Grand River as venue by the venue registration deadline, the artists in the river register by the artist registration deadline, then the City approves a connection with those artists within the matching period, all parties are operating within the structure ArtPrize setup. A venue can set its own deadline for submissions, based on its internal selection process. The early deadline for the Grand River certainly makes things inconvenient for artists interested in that venue, but it’s the only way for final approval to happen by the end of the matching period. If artists send proposals directly to the City to apply for the River as a venue, does that mean all proposals should be sent directly to venues? Unless there are special instructions on the profile of the venue in question, the artist profile page will serve as the proposal. The Grand River venue is a special case, and other venues will not work this way. During the matching period, artists will request a connection with a venue thru artprize.org. The venue will view the artist’s profile page, which includes the artist’s proposal (very much like a dating website). Questions about applying to the River should be directed to Jose Reyna (jreyna [at] grcity [dot] us, 616.456.4075).